Bajo Aragon County has an extension of 6000 square kilometres. Alcañiz occupies 7.8 of the total area of the vicinity, which occupies 472 square kilometres. It is one of the largest areas of Aragón. The average altitude of the area is 600 metres. Alcañiz altitude is 381 metres. Alcañiz is surrounded by hills. The most famous are Cabezo del Cuervo hill and Cerro de Pui Pinos. Alcañiz and its surroundings enjoy a typical Mediterranean landscape. The land is very dry due to very low rains (350mm yearly average) irregularly distributed during the year. The winter season is cold and wet. The temperature may drop below zero in some days. The Cierzo, a dry and cold wind that blows from the northwest, it is typical in this area. There are many foggy days during the winter. The fog makes the temperature drop during the winter season. The summer is hot and dry. The temperatures can get very hot especially when the wind blows from the south, producing the famous Bochorno. We can say that the weather in Alcañiz is a mixture between Mediterranean and continental climates. In the Bajo Aragon it is still possible to enjoy a variety of ecosystems of great environmental and ecological value. We can find dry environments as well as steppe. Steppe landscapes have their typical salty reservoirs. We can also find humid areas and also dense forest. The most common tree in the area is the Carrasco pine, a kind of red pine. The vegetation and ecosystems that we find in this area are hard to find any place in the Iberian Peninsula. The most common landscape in this area are fields of olive trees, cereals, and no so often stock fields. In areas not used for agriculture it is very common to find shrubberies and bushes such as thymes and rosemary. Even though the landscape its pretty rocky and uneven there is a great natural wealth in this area. We should point out the value of the salty reservoirs. They constitute an ecosystem unique in Europe: The pine forest La Mangranera, close to Andorra, its a rare example of Mediterranean forest that has survived over the centuries. The Guadalope river, its riversides an of course its beautiful reservoir built in 1927 La Estanca with an area of 875.000 square meters, and capacity of 11 millions of cubic meters. La Estanca gets its water from the Guadalope river trough a channel used for irrigation purposes in Valmuel and Puigmoreno, two neighbourhoods which main activities are focus in agriculture. 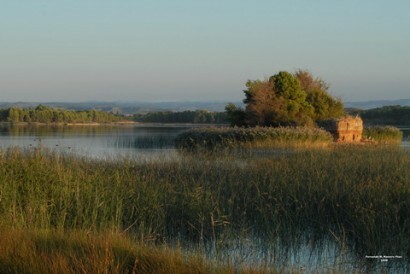 The Guadalope River can be found between the basins of the rivers Martin and Matarraña. The river suffers evaporation during the summer due to high temperatures. The Guadalope River is the second tributary of the Ebro River from the right riverside. The Guadalope River pours 228 Hm3 per year. The Guadalope River irrigates 16.470 Hectares. Water supplies have always been very important in the Bajo Aragon area, therefore a large number of reservoirs can be found in the area. Among the more important is the Pena reservoir in Valderrobres with a capacity of 19 hm3. The Santolea reservoir in Castellote with a capacity of 54 hm3: We can find another reservoir in Calanda with a capacity of 54 hm3. La Estanca reservoir in Alcañiz with capacity to hold 7 hm3. The Gallipullen reservoir in Alcorisa which has a capacity of 3, 5 hm3 and the Caspe reservoir with a capacity of 80 hm3. By looking at all of these reservoirs we can conclude that the Guadalope river one of the most hydraulically controlled river in the Iberian Peninsula.